What is a weekend without Stephanie Plum? I promise, I’ll run out of books to read eventually. 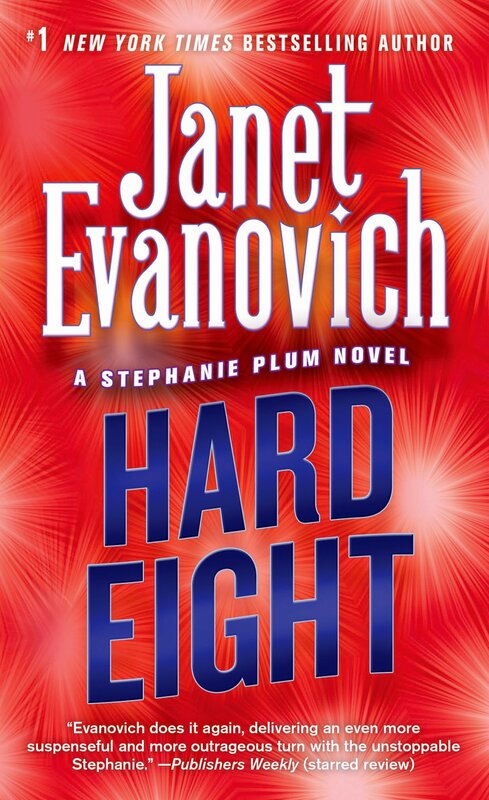 For now we take a look at Hard Eight , the 8th book in the Stephanie Plum series by Janet Evanovich. When we left Stephanie Plum she had just solved a murder, saved her friends and her grandmother and was left without her on again off again boyfriend Joe Morelli. Ranger had made a deal with Stephanie and she wasn’t sure how she felt about it. In Hard Eight Stephanie is asked by her grandmother’s friend, Mabel, to help find her granddaughter, Evelyn, and great grand daughter, Annie. In a messy divorce the two have disappeared and she is afraid something has happened to them. Stephanie’s cases can never be easy & they seem to always interrupt a situation with the police. Eddie Abruzzi, a not so nice bar owner is also after Evelyn and he is not thrilled when Stephanie get’s involved in the hunt. From snakes in her apartment to men in bunny & bear costumes chasing her, he is determined to make her life hell. On the other hand, it also adds to Stephanie’s mom’s wish for her to get a new job. One of my ongoing favorite things about the Stephanie Plum novels is the number of side conversations and one-liners throughout the books. Between Grandma Muzar, the things Bob eats and Joe Morelli’s constant need to try and get Stephanie to listen to him I spent half the book with the “highlight function” on my Kindle. Ranger finally comes to collect on his “deal” with Stephanie since she and Morelli are “on a break” (Ross and Rachel, anyone?). He isn’t stupid and knows that she is still in love with Morelli and forces her to think about it. While Ranger always seems to take care of Stephanie, it becomes obvious that Morelli is where her heart is and ultimately they admit that they need to talk…at some point. While each book follows a simliar format, I am continuing to love the Stephanie Plum series. They are funny, witty and still always have a twist at the end. I can’t read to pick up To the Nines but while I wait for it at the library I’m heading over to my first of the Between the Plums Series, Visions of Sugar Plums . Hard Eight was my “Book you own but never read” for the 2015 Pop Sugar Challenge. Okay I borrowed it from the library but “owned” it on my kindle for 2 weeks, so it counts right? What do you think? Should Stephanie stick with Morelli or Ranger?